Oglebay Institute’s annual Holiday Art Show & Sale is an extraordinary holiday shopping event featuring fine art and crafts from the region’s most talented artists. 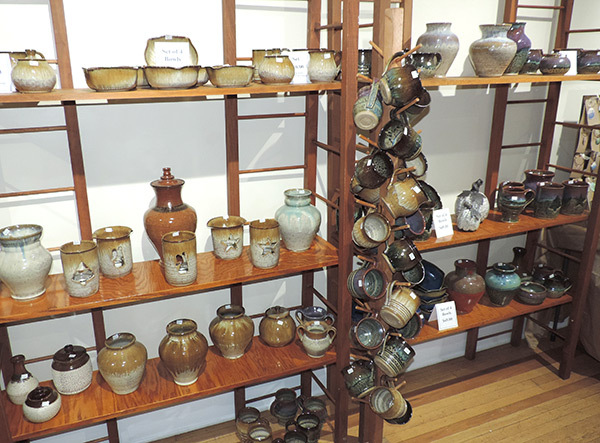 The exclusive six-week show provides an outstanding opportunity for selected artists to sell to thousands of enthusiastic shoppers in TWO ideal locations – the historic Stifel Fine Arts Center, located on the highly traveled National Road in Wheeling, and the Schrader Environmental Education Center, located in the world-class Oglebay Park. Part of the Oglebay Institute mission is to serve as a resource for artists and emerging artists and provide opportunities for them to exhibit, sell and promote their work to the public. The Holiday Art Show and Sale provides extensive space, staff and marketing resources to artists and gives the public a refreshing alternative to traditional retail. Shoppers can purchase one-of-a-kind gifts for the holidays while becoming familiar with the work of numerous artists and artisans. In order to ensure a high standard of quality, Oglebay Institute’s Holiday Art Show & Sale is a juried exhibition. Applications will be available on this page beginning in August. Applications must be submitted ONLINE ONLY at the bottom of this page. Exposure to thousands of Ohio Valley shoppers, as well as out-of-town guests visiting Oglebay Park and the Festival of Lights. Aggressive marketing campaign valued at more than $10,000 that includes television, radio, newspapers, billboards, direct mail, email blasts, social media and more. Exposure and sales opportunities during Oglebay Institute’s well-attended holiday events. Artists may sell any original works or prints of their own design as well as gourmet food items such as jams or mixes. (No unpackaged foods please.) Any medium is acceptable that can be displayed safely in your space. You may sell your work for any price, but we recommend pricing your work to sell. Consider offering affordable prints along with original artwork. Oglebay Institute takes a 10% commission on all sales. Please price your artwork accordingly. How large are the spaces? The exhibit space is divided into sections ranging in size from 3-10ft wide. For wall/booth spaces you may hang your work from backing boards behind your table. Each artist who has wall space may also place a table in front of their space. For artists who just have floor/table space, you may set-up a table or shelves. All artists must supply their own shelves and tools needed for displaying their work. Please be considerate of fellow artists when setting up your space. 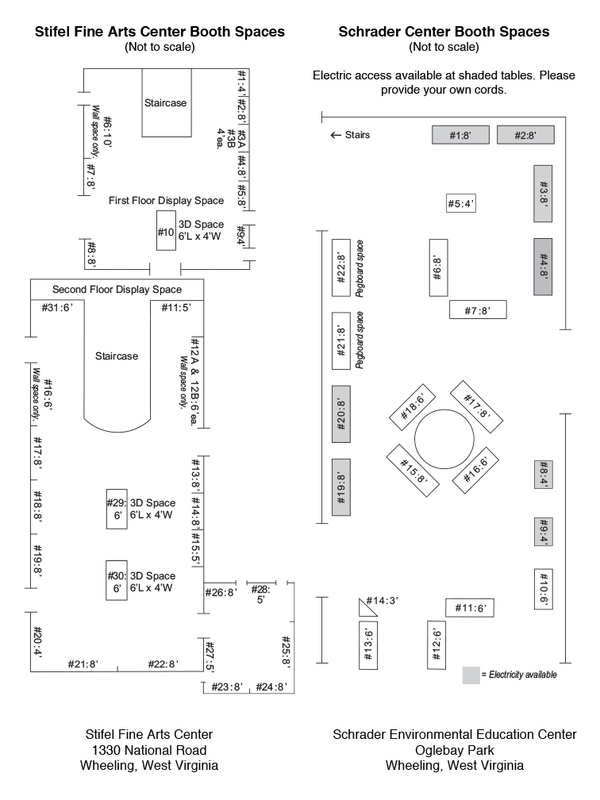 Click here for booth space layouts as they will appear in each gallery. How much are booth spaces? How will you keep track of my sales? Each artist will be given a booth number. You must write your booth number on every price tag. Every piece of art must have its own price tag. When a customer takes their purchase to the register, that booth number, as well as the purchase price will be recorded on a sales log. 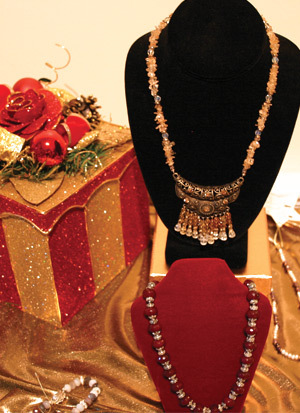 At the end of the show, your total sales will be added and a check will be mailed to you minus a 10% commission. Entry applications are available online at the bottom of this page. Applications must include at least two digital images and preferably one booth image. A $20 non-refundable application fee is required for each entry. Your payment will be taken through PayPal upon the successful completion of your application. Jury results will be mailed late October. Payment-in-full of booth fees are due upon acceptance into the show. Application deadline is October 8, 2018. Last day for refunds, if cancelling, is November 2, 2018. If chosen to exhibit, vendor installation and set-up is November 9 & 10, 2018.